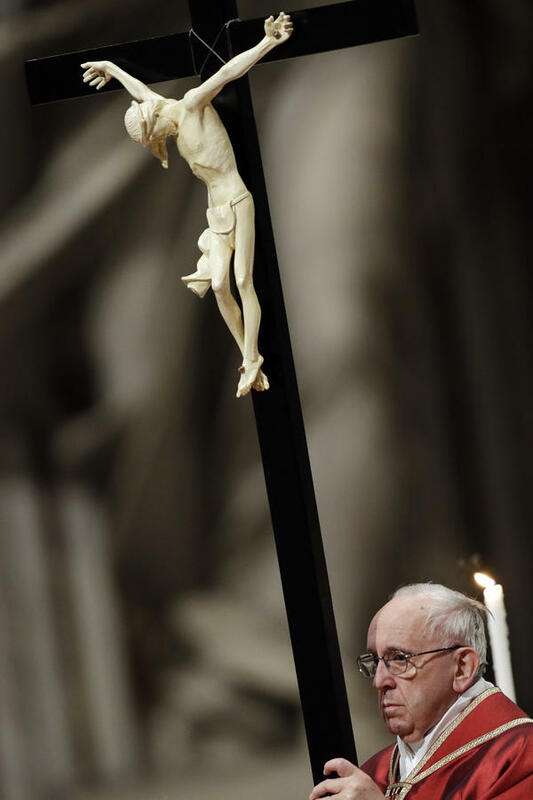 Pope Francis holds a crucifix as he celebrates the Good Friday Passion of Christ Mass inside St. Peter's Basilica, at the Vatican, on Friday. NPR's Two-Way Blog made an embarrassing mistake in a story that ran on Good Friday; a headline on a Washington Post column said the NPR report "mangles the definition of Easter" — and that's an understatement. Some media commentators and a few readers (including one whose complaint letter included the quote above) cited the error as evidence of the lack of religious literacy in the NPR newsroom. Here's how the NPR blog described Easter: "Easter — the day celebrating the idea that Jesus did not die and go to hell or purgatory or anywhere at all, but rather arose into heaven — is on Sunday." Corrected, the piece now describes Easter, accurately, as "the day Christians celebrate Jesus' Resurrection." I'll leave the theological explanations for what is wrong with the original statement to other commentators; in addition to The Washington Post piece, there was this Christian Post piece. I wanted to understand how the error happened. As one emailer wrote to my office, reporters make mistakes but editors should catch them. Domenico Montanaro, who is NPR's lead political editor, was substituting as editor of the Two-Way Blog last week. He told me by email: "I was poking around to see who in the newsroom might be interested — on Good Friday — [in] the Vatican clarifying that the pope does in fact believe in Hell (of course, he does!)" He added, "I knew there would be an audience for it and the very reason that Vanessa [Romo, the author of the piece] and I come from a religious background is why we were interested." He said both he and Romo were raised Catholic. Montanaro called this "a case of moving too quickly (and maybe forgetting some of the details of our CCD classes). I was trying to maintain the writer's voice as much of the piece is somewhat tongue firmly planted in cheek. So I breezed by the last sentence. On second read, after hitting publish, I quickly simplified and corrected." Indeed, the correction was made within the hour after some readers reacted, said Mark Memmott, NPR's standards and practices editor. Memmott said the error "underscores that sometimes we need to slow down and read things carefully." The newsroom "moved too fast," he added. "Everybody involved was raised and educated to know these things and just blew it." Ironically, reporters often get in trouble when writing quickly off the top of their heads about topics they are actually versed in, rather than those they are less familiar with. In those latter cases, they often feel more of a need to stop to check the facts. Contrary to some of the commentary, I don't think this error signals anything about the level of religious education among NPR employees. I see it more as evidence of a problem I've written about before: the errors that crop up because NPR does not have enough editing oversight. Without that extra level of copyediting that provides a backstop, reporters and editors need to be particularly vigilant. "My parents, grandparents and my religion instructors and advisers at Archbishop Molloy and my Biblical and Classical professor in college will be mightily disappointed. But they also believe in the power of penance ... and forgiveness."